My niece, who lives on the other side of the country, emailed me the other day and just asked, "Are you alive?" She relies on blog posts to keep track of me and I have not posted in TWO MONTHS! The answer is, "Yes, but I have been busy and not taking time to write blog posts." There is work and the yard and the garden and Relay for Life and crocheting owl hats and my new one, owl purses. Work is going great but definitely keeps me busy in the mornings. I have rearranged my work schedule so I can usually have Fridays off which has been great! After almost a year at the job I can say that I really do love being a church secretary administrative assistant and I am glad I am back at it! In between rain showers and work I have been working in the garden and flower beds. There is still a long way to go but the weeds in the garden at least are under control. With the recent rains, the strawberries are growing like crazy and it looks like we will have a very good crop again this year. 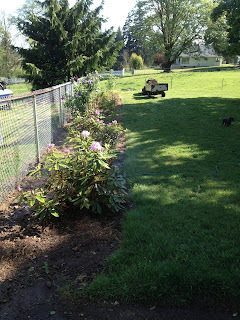 Here are two of the flower beds I have been working on. One is a small bed that has calla lilies, dianthus, iris and lily of the valley. Up until this past week it also had a lot of weeds. I got rid of most of those and moved the iris you see on the left (in front of Miss Lucy) out from under the bushes. I hope to move a few more iris into this bed as they seem to do really well there. 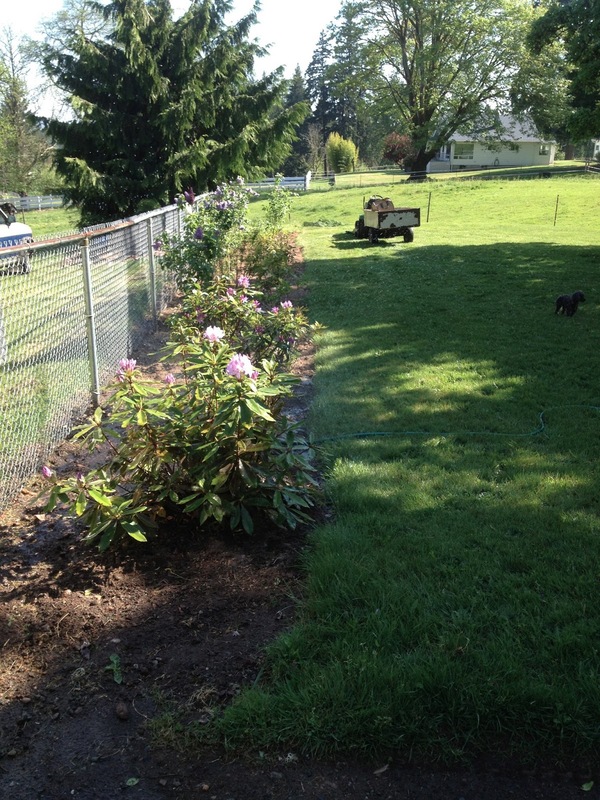 The other is about 6' X 40' and has azaleas, hydrangeas, rhododendrons and lilacs along with a few other bushes. My goal for this year is to get this bed barked over! Relay for Life in next weekend so I have been doing things to get prepared for that which included a used book and plant sale a few weeks ago. Owl hats usually sell quite well at Relay so I want to have some on hand for that and I saw a pattern for adorable little owl purses that I can make out of the balls of yarn that are too small for the hats. I have almost 20 of the purses ready to sell also. Isn't that just the cutest thing? 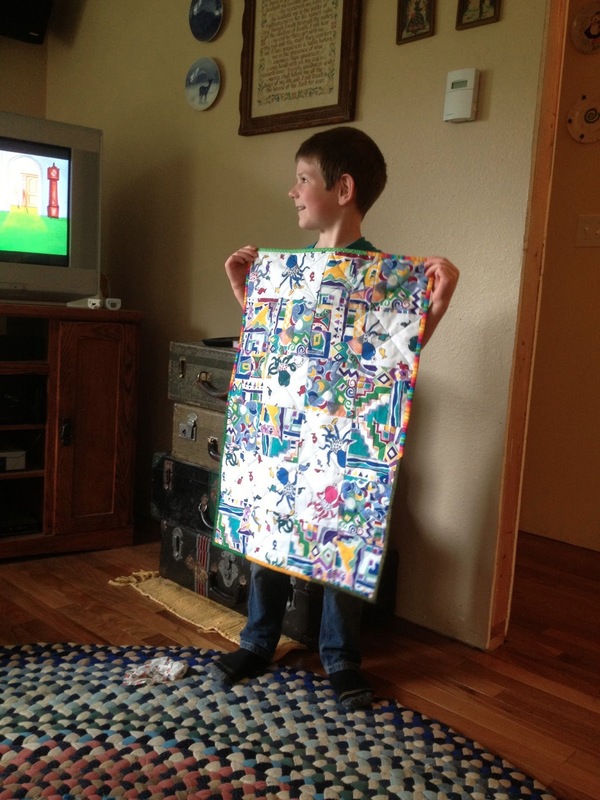 Also, since my last post, the grandkids visited for a few days and my grandson was able to finish up his first quilt which he started at the quilt show in March. When they visit this summer I am sure there will be more sewing going on! My daughter that lives with us is a substitute school bus driver for one of the local districts and in recent weeks she was preparing for the school bus road-e-o. Last weekend she competed and got second place for rookies and was about in the middle of the pack for all drivers. As you can see below, I got a chance to be a good mother and embarrass her as she accepted her plaque. I haven't been doing much sewing but about two weeks ago was reminded that it was time for graduation quilts at church and since I had said I would make them that meant I needed to get busy. It was calculated that we would need two and both were for boys so I pulled out a bunch of plaid flannel that a friend gave me and started cutting. I decided on double 4-patch based on pieces that she already had cut. I determined I would need 1020 smaller squares and 255 larger squares and managed to get the smaller ones but was a bit short on the larger ones. I pieced some of the extra scraps to make the final 25 or so larger ones. Here are the some of the small ones. Oh, the lint that flannel creates! I worked at it and got both tops done yesterday morning and after figuring out the backs, got both basted and one quilted yesterday afternoon. The second one got quilted today. I think they turned out pretty great. I was cutting the binding and wondered where I was going to store it until needed and remembered that I had an empty drawer in my sewing cabinet and discovered it was a great place to 'stage' my binding when I was sewing it on. So that is what I have been up to for the last two months. Hopefully I will be back here sooner next time. I wanted to email you to see if you still are offering the denim quilt pattern. I tried to email, but somehow, my computer doesn't like that function. If you still have the pattern for that quilt and have a moment would you mind emailing that to me? It's a great quilt and I would love to do that with my Dad's old jeans. My email address is: momacita22[at]yahoo[dot]com. Thank you so much!